it is there that the intellectual life of the town should centre. As time goes on there should be built up a museum and picture gallery." It is quite possible that if Hiram Walker hadnt located his distillery on this side of the river in 1858, Windsor wouldnt have an art gallery. Instead, his decision to move his flouring mill and small whisky distillery from Detroit to waterfront land just east of Windsor, proved to be the catalyst not only for a world famous product but for a world class art gallery. A few years after Walkers death in 1899, construction of an elaborate manor for his oldest son, E. Chandler Walker and his wife Mary Griffin Walker, commenced in the Town of Walkerville. Among their plans for manors interior was a specific request regarding the positioning of wall sconces to permit the display of their extensive art collection. Chandler was a generous art patron and personal friend to many artists, especially the Impressionists. The manors drawing room once held priceless paintings by Monet, Renoir, Pissarro and Cassatt. At one point, Chandler loaned 49 of his paintings for an exhibit at the Detroit Museum of Art. The heirs of Edward Chandler Walker deeded Willistead to the town of Walkerville after his death in 1921, with the stipulation that it be used as a park, a library, and for any purpose in the public interest. Mrs. Walker donated most of the paintings to the Corcoran Gallery in Washington, D.C.
A public library was created on the main floor of the Willistead manor with offices for the Corporation of the Town of Walkerville on the second and third. A fine librarian was hired, Miss Anne Hume, and we can thank her for initiating the public exhibition of art in this area. Hume convinced the Royal Ontario Museum to loan a selection of Egyptian, Roman and Chinese treasures to the library in 1922 and then trained her sights on the National Gallery of Canada. After months of negotiation, she arranged for the loan of ten Canadian paintings, including works by J. E. H. MacDonald (leader of the Group of Seven) and William Brymner. These paintings hung on the walls of Willistead Library from 1923 to 1925 and cost the Walkerville Library Board exactly 80 dollars. 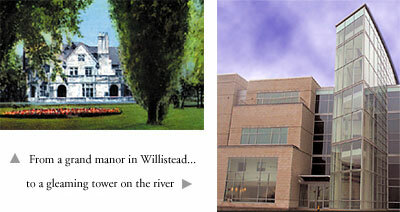 For the next 53 years, the name Willistead would be synonymous with art in the Windsor area. When the Depression took hold in the early 1930s, the Library Board could no longer afford shipping and insurance charges for further exhibits. The amalgamation of the border cities (Windsor, Sandwich, Walkerville, East Windsor & Riverside) in 1935, whilch had met with considerable resistance from Walkerville citizens, happily resulted in renewed interest in the local art movement. The newly organized Local Council of Women underwrote the cost of a very successful major exhibition of Canadian paintings. Upon the shows conclusion, a public meeting was held in Willistead and the Windsor Art Association formed in 1936 with a mandate to hold regular art exhibitions in the city, fostering an appreciation of the visual arts in the community, and ultimately establishing an art gallery in Windsor. With the arrival of Kenneth Saltmarche as director in 1946, a new phase of art appreciation began. Under his enthusiastic guidance, the Art Gallery and the visual arts became an integral part of our community exhibitions were more frequent and of improved quality, informative gallery talks and art classes were developed and the Picture Loan Service inaugurated. The Womens Committee was founded in 1953 under the leadership of Mrs. W. R. Campbell  membership campaigns and fundraising projects were initiated and paintings were purchased for the permanent collection. The Annual Sale of Canadian art became a signature event every year. By 1958, attendance at Willistead tripled, but an increase in activity had negative repercussions. In 1959, inadequate space, insufficient financing and conflicting administration between the Art Association and Library Board, resulted in the discontinuation of the art program at Willistead and the resignation of the director. The Windsor art movement was in danger of collapse. After negotiations with City Hall, Windsor City Council recognized Willistead Art Gallery as an independent institution with its own Board of Directors and initiated an annual grant to assist with operation costs. The reorganization of the Gallery, which included improved facilities, proved a great stimulus  attendance figures soared to 44,000 by 1966. However, by 1967 the Gallery again faced a crisis inadequate space motivated the Board to reassess its facility. One suggestion was to keep the gallery at Willistead - but in a new building designed to complement and enhance the Manor House. The Gallerys permanent collection (now numbering 330 pieces with a value of $176,000) is not safely housed. Renovations to correct these deficiencies would be prohibitive in cost and would completely destroy the character of this period building. The dual occupancy of Willistead is a continuing problem. Public Library and Art Gallery activities are so different in character that conflict and disturbance is inevitable." The Planning Committee decreed the only solution to the crisis at Willistead was the construction of a new art museum. A downtown location would place the Gallery at the transportation hub of the city and in the area of maximum population concentration. This would be a culmination of the art movement launched by Miss Anne Hume forty-six years ago." In 1970, after three years of searching fruitlessly for a new building and attempting to raise funds to build onto Willistead, a "miracle" occurred. Mayor Frank Wansborough suggested the abandoned Carling Brewery Warehouse on Riverside Drive, just west of downtown might be worth consideration. There was unanimous agreement that the well-built 15-year old structure was large enough and suitable for an art gallery, once renovations occurred. For the princely sum of $1, it was sold to the Art Board. After a year of ambitious fund-raising, nearly $3 million was raised to finance renovations. In September 1975, Mayor Bert Weeks officially opened the spacious new gallery. For almost 20 years, the converted warehouse served the needs of the gallery. A master plan completed in 1991 pointed the Gallery, also known as the AGW, in a new grander direction. With the arrival of Casino Windsor, the opportunity to acquire sufficient funds to finance the master plan was in sight. The AGW leased their riverfront location to the Ontario Casino Corporation to serve as an interim Casino site and the gallery "temporarily" moved into the Devonshire Mall. This arrangement, while not an ideal environment for displaying art works, brought art a little closer to the public and gained the AGW national publicity. As well, the AGW gained over $23 million in rent for the old warehouse. When the permanent Casino Windsor was established, the AGW board deliberated whether to relocate to its riverfront location and renovate yet again, or build a new creation in another spot entirely. The gallery was offered space in the still-to-be constructed Chrysler Centre at Riverside and Ouellette; Glengarda, a former convent on Riverside Drive East, was briefly considered for renovation. Finally, in July 1999, Dr. Lois Smedick, President of the AGW Board of Directors unveiled plans for a new art museum on the old warehouse location. Shortly thereafter, the old Carling warehouse was torn down, and a gleaming new gallery rose in its place. On February 10, 2001, the new Art Gallery of Windsor will officially open its doors. Impressionist Masterworks from the National Gallery of Canada is the eagerly awaited first exhibit. Art in Windsor has come full circle in an elegant and synchronistic way, the Impressionists, so beloved by E. Chandler Walker have returned. Undoubtedly, Chandler, whose own Impressionist collection graced the walls of Willistead 90 years ago, will be there in spirit. Research materials, photos and recollections kindly provided by Dr. Tom Robson.